Navigate the Appain Way on a bike during this 6-hour guided bike tour in Rome. Covering 18 miles (30 kilometers), the route passes the Tomb of Cecilia Metella, and other important landmarks and includes a guided tour of the San Callista Catacombs. Best for intermediate-level cyclists; use of a mountain bike or electric-assist bike and helmet included. Meet your guide and group at Via Labicana 49, the Top bike Rental and Tour that is near the Colosseum metro Station (B line). Meeting time for the tour is 10:30am (winter) or 2pm (summer). 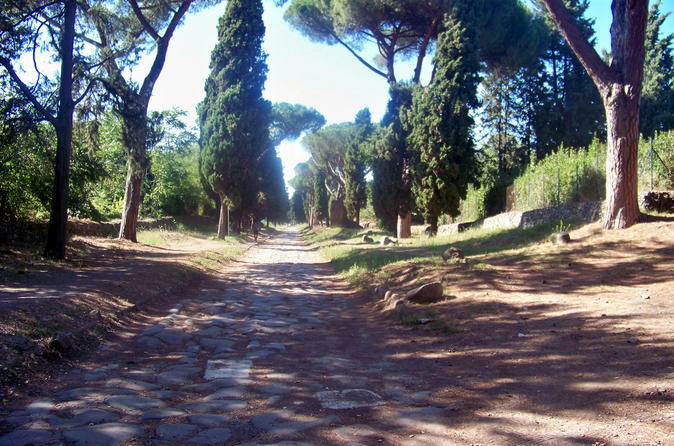 Don your provided helmet and choose between a mountain bike and an electric-assist bike, then mount up and head off down the cobblestones of the Appian Way. Make stops to listen to your guide's commentary about the route's history, including its identity as an early Christian burial site. Stop at San Callisto Catacombs for a guided tour. Pedal past the Circus of Maxentius to see the Tomb of Cecilia Metella and enjoy the countryside vistas on the way to the Aqueducts Park and the Nymphaeum of Villa dei Quintili. Park your bikes and take a break for wine and cheese before continuing through Caffarella Park and returning to the original departure point.